Up the passion and treat your loved one to this romantic collection. Four bars lovingly wrapped with red organza ribbon and a special recycled-card tag. Include a custom message (optional). Includes our Goji Berries & Vanilla, Mint, Orange, and 68% cacao bars. Four reasons to get hearts racing. 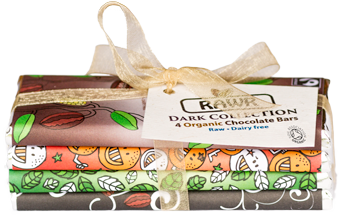 Satisfy your darkest desires with four organic bars, from 68 to 80% cacao content. 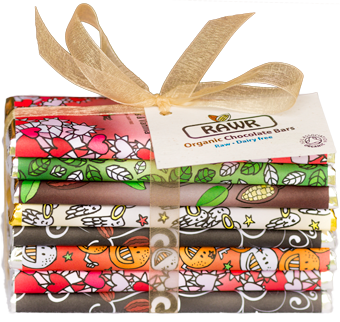 This gift wrapped collection comes together with chocolate-brown organza ribbon and a special recycled-card gift tag. Featuring 68% Cacao, 80% Cacao, Orange, and Mint bars.